I used an A4 cream textured card folded to a two fold. I then created a topper using navy blue card. The outer pattern is embossed onto parchment paper and I attached the photo to the middle from behind with double sided paper, therefore giving it an opaque look. The words 'Treasured Memories' are also embossed and attached to navy blue card. To finish the card off I attached cream pearls to each corner and ribbon, which I then looped through to give a pretty finish. My friend was extremely touched by this card. Parchment is a lovely craft and can produce some spectacular results. It has been around for a long time, and is now becoming ever more popular. The effect can be created by tracing a pattern onto parchment paper with a white pencil and then varioius tools used to get the different results. There are also CD's available now that eliminate a lot of the time consuming work. They give you the pattern ready to print off on to the parchment and then you can start to emboss directly from that pattern. It simplifies things for you but the results are just as good. 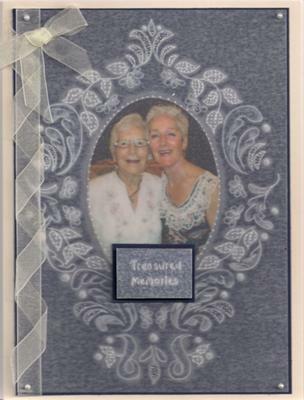 This card shows the beautiful effect that can be achieved with a llittle patience, and I am not surprised that your friend was delighted Debbie. Your card is lovely. It is something I would also like to try but maybe sometime in the future. This card is really beautiful and embossing on parchment gives a really lovely finish. I will certainly be having a go myself before too long. A lovely card. I am sure your friend was pleased with it. Well done. I haven't seen much cards with this technique, It is very beautiful and elegant!